The use of biotechnology in chemical synthesis offers up numerous advantages to the engineer in the process industries, but it also presents a number of fundamental challenges and difficulties which impinge directly on separation process requirements. The use of biochemical separations has grown significantly during the past decade, and is especially used in process industries such as healthcare and food processing. However it is becoming increasingly more important in areas such as recycling and waste-water treatment and as industry shifts towards cleaner processes biochemical separations will continue to grow. 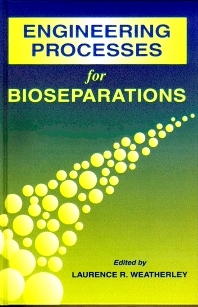 The two main objectives of this book are to focus on the application of existing separation process techniques to the recovery and purification of biologically derived products and to examine the state of knowledge of new techniques which have future potential. Within these objectives the complexities and breadth of problems associated with biological separations are discussed, specific engineering techniques are featured and their adaptation to biochemical separations are highlighted. Chemical and biochemical engineers and industrial microbiologists in the food, pharmaceutical, biotechnological, brewing and distilling industries and related process industries.